Whether they are hitting the studio at 6 am or right after work, you admire the cool yogi for their dedication to yoga and their calm, collected ways. Great as a stocking stuffer or paired with a reusable water bottle, this Rumi x Feel Good Headband is a gift your stylish yogi can appreciate. 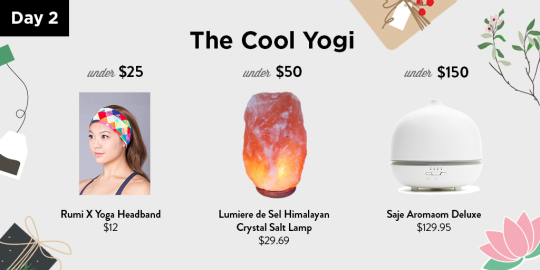 A gift your spiritual friend may enjoy is this hand crafted Natural Shape Himalayan Crystal Salt Lamp. Not only a unique piece of decor, this lamp has many health benefits as well including improved mood and reducing fatigue. Like the Himalayan Crystal Salt Lamp, essential oil diffusers are known to release negative ions in the air, which can help boost your well-being. This oil diffuser also purifies the air and can be used as a humidifier. Stay tuned for more gift ideas in the next 11 days!